"Haters gonna hate" is an appropriate statement for some Aquaman sentiment prior to the launch of the New 52 by DC Comics. I'll fully admit that I was a hater due to the fact that I had read some Aquaman comics from the 1980s and 90s that were less-than-interesting. The New 52 launch changed everything for me. After I read an impressive first issue and purchased an even more impressive Aquaman #2 I have shredded my Aquaman Haters Club Card. Writer, Geoff Johns, and penciller, Ivan Reis, have a winner and they've gone from a humorous well-paced first issue to a thrilling action-packed second. 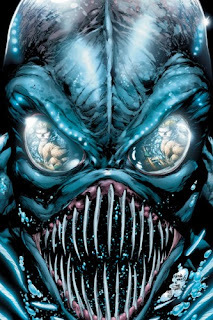 Aquaman #2 begins with the freakish evil sea beings that are in search of food. Fortunately, they find a ship out at sea and are pleased to find the food they are looking for, which is the crew. The ship returns back to a harbor sans the crew and the local authorities search for Aquaman to solve the crime. Not only do we have the local authorities, but it seems that the Coast Guard and Navy are brought in as well to investigate. Mera is still with Aquaman, so both assist with the investigation despite some wisecracks from some of the authorities. The evil sea beings attack and we are treated to an awesome battle. Aquaman #2 ends with one of the creatures trying to take Aquaman back to their lair at the bottom of the ocean. Kudos to Geoff Johns for a great issue that has plenty of action. The Aquaman jokes are not as abundant in this issue but I believe that he is in slight danger of going to the well one too many times for a laugh at the expense of Aquaman. Yes, Aquaman has been the punchline to many jokes and the joking continues with this series. However, I do understand the idea behind the joking, which is to establish Aquaman as a superhero that should be respected. Also, I am pleased with the way Johns has added the Aquaman biography to the first two issues. There are many readers that are not familiar with the story of Aquaman, and Johns does do a great job of adding the back-story to get new readers acquainted. The artwork by Ivan Reis is very impressive and I really enjoyed his splash page that showed the investigation scene at the harbor. But the best of his work was placed on the cover because we area treated to a big close-up of one of the big ugly bastards that are fighting Aquaman. I loved the added touch where we can see Aquaman in the pose from the first issue in the reflection of the sea creature's eyes. Very nice, Mr. Reis. Those 2012 apocalypse people might be right due to the fact that I am excited to see the third issue of Aquaman.